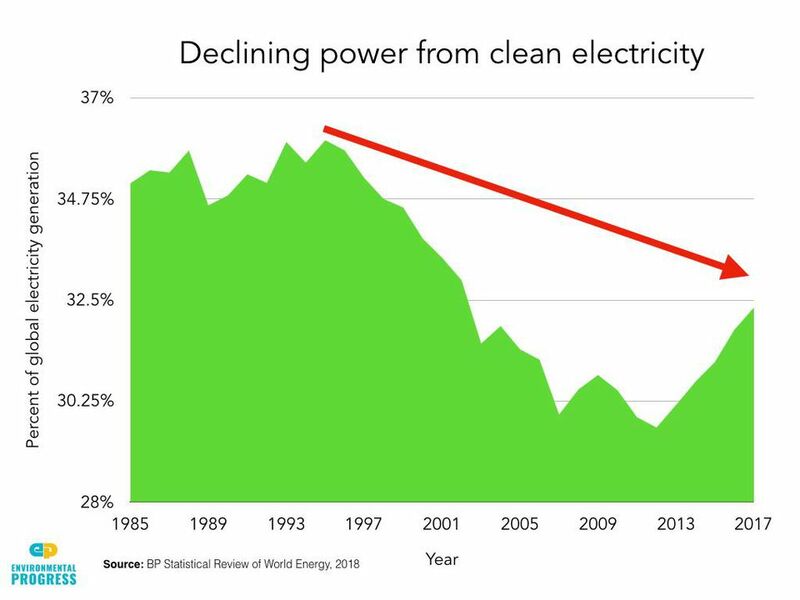 According to BP’s 2018 edition of its Statistical Review of World Energy, renewable energy has not been able to fill the void created by retiring nuclear plants despite its large growth in 2017. 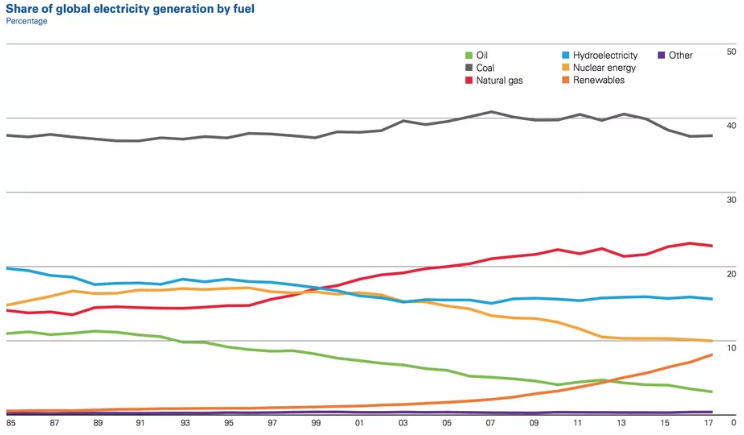 As a result, the share of non-carbon power generation has fallen slightly over the past 20 years. The data is further evidence that energy sources such as wind and solar cannot replace coal and other fossil fuels and will not lead to significant reductions in carbon dioxide emissions despite decades of subsidies. Despite non-hydroelectric renewable generation increasing by 17 percent, wind and solar accounted for only six percent of total electricity globally. Public and private entities spent $1.1 trillion on solar and over $900 billion on wind between 2007 and 2016. Global investment in these renewable sources was about $300 billion per year between 2010 and 2016. The $2 trillion in solar and wind investment during the past 10 years represents an amount similar to the global investment in nuclear power over the past 54 years, which totals about $1.8 trillion. Global energy demand grew 2.2 percent last year–above the 10-year average of 1.7 percent—and up from the previous year’s 1.2 percent increase, due to faster economic growth in both developed and developing countries. The energy demand growth and continued use of fossil fuels increased carbon dioxide emissions by 1.6 percent in 2017 to a new record of 33.4 billion metric tons, after remaining relatively stable for three years. China and India accounted for nearly half of the increase in global carbon dioxide emissions. The largest increase in carbon dioxide emissions in 2017 were from China (1.6 percent increase), which was a reversal from the past three years when the largest increases in emissions came from India. China’s emissions in 2017 were 0.3 percent higher than the previous peak in 2014. The next highest increment came from India where carbon dioxide emissions increased by 4.4 percent. Carbon dioxide emissions in the European Union were up by 1.5 percent with Spain accounting for 44 percent of the increase. Germany’s carbon dioxide emissions also increased over the past two years, despite spending $200 billion on renewable energy over the past two decades. Germany is not expected to reach its goal of reducing carbon emissions by 40 percent by 2020 compared to 1990 levels. Germany’s Energiewende (energy transition to renewable energy from fossil fuels and nuclear power) has cost the average German an estimated $2,500 without reaching its goals. Carbon dioxide emissions in the United States decreased by 0.5 percent. It was the third year in a row that the carbon dioxide emissions in the United States declined. This is the ninth time in this century that the United States has had the largest decline in emissions in the world. Carbon dioxide emissions from energy use from the United States are the lowest since 1992. 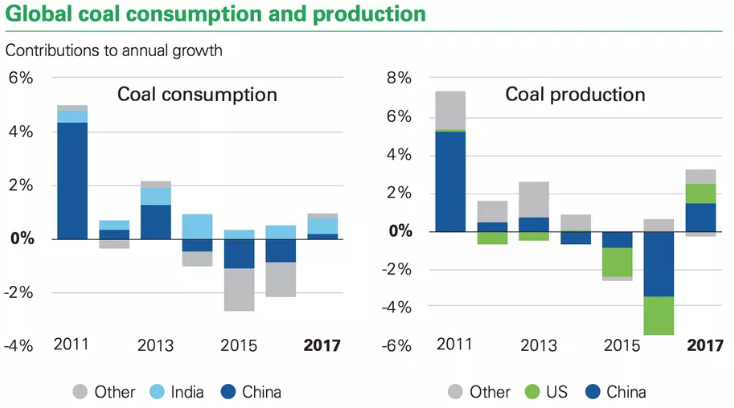 Coal consumption increased one percent in 2017 due to the opening of new coal-fired generating units in China and India. This was the first increase in coal consumption in 4 years. However, it was still 3.5 percent less than its peak level in 2013. Coal’s share of global power generation was 38 percent in 2017—the same as in 1998. Its share had increased in the intervening years when China hit its very high years of economic growth but fell slightly over the past few years, ending at its starting point two decades ago. Coal consumption declined in the United States and the European Union, but increased 0.5 percent in China. China remains the world’s top coal market, with the country consuming 50.7 percent of the world’s coal in 2017. Oil production cuts by OPEC and non-OPEC countries of almost 1 million barrels per day in 2017 were offset by increased production from the United States and other countries of 1.5 million barrels per day. A new oil production record of 92.6 million barrels per day was reached in 2017–the eight straight year global oil production increased. In 2017, the United States was the world’s top oil producer when natural gas liquids are included, exceeding 13 million barrels per day, followed by Saudi Arabia at 12.0 million barrels per day, and Russia at 11.3 million barrels per day. Oil demand grew by 1.7 million barrels per day, and totaled 98.2 billion barrels per day in 2017. Oil consumption includes biofuels and fuels derived from coal and natural gas. U.S. consumption increased by 1.0 percent, leading the world at 19.9 million barrels per day. China’s demand increased by 4 percent to a new record of 12.8 million barrels per day. Natural gas consumption grew by three percent to a new record of 355 billion cubic feet per day—the fastest growth since 2010. China’s gas consumption increased by 15 percent. Natural gas production increased by 4 percent. The United States led all countries in both production and consumption of natural gas. Global solar power generation increased by 35 percent and global wind power generation increased by 17 percent in 2017. 2017 was a year of record oil consumption, natural gas consumption and solar and wind power consumption. But, despite record growth in wind and solar power, carbon dioxide emissions grew 1.6 percent due to declining nuclear power production. Renewable energy could not replace retiring nuclear units in 2017 due to its intermittency and lower capacity factors and therefore is unlikely to meet global demand anytime in the foreseeable future, despite opposite claims by environmentalists. As a result, both global coal consumption and global natural gas consumption increased in 2017. Interestingly, the United States, which President Trump removed from the Paris Accord last year, had the largest carbon dioxide emissions decline in the world, while the European Union’s emissions went up, along with those of China and India, and the world as a whole. Could a Renaissance Be in Store for Existing Nuclear Plants?